A hidden gem in downtown Montgomery, The Tavern & Porter Room offers two underground, full service event spaces for your next private affair. Set with handcrafted dining tables and classic pub decor, our spaces create a unique and memorable experience for your guests. It can accommodate up to 40 people for a seated dinner, and up to 100 people for an informal occasion. For inquiries call Monday through Friday from 9 AM to 5 PM at (334) 531-9546 to request a booking or click below to submit a request. Located downtown under the new Dreamland BBQ location at 12 West Jefferson. The Tavern is the more formal of the two spaces. Set with hand-crafted wooden dining tables offering communal seating for about 40 people. If you are booking a party to connect with your guests on a personal level, this is the space for you. The Tavern has a spacious layout accompanied by vintage furniture and a fully functional bar. 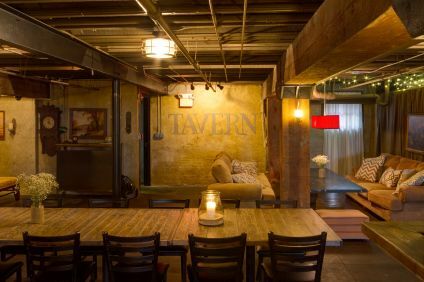 Set with hand-crafted wooden dining tables, The Tavern offers communal seating for about 40 people. Having such a spacious layout, The Tavern can accommodate up to 100 people for a cocktail style party. In addition to dining tables, the Tavern is memorable by it's vintage furniture pieces and conversational nooks. These couches and chairs create a relaxing ambiance for you and your guests, while making you feel right at home. The Tavern is the dimmer of the spaces in terms of lighting. We have minimal overhead lighting that can be dimmed or brightened, as well as various lamps and wall sconces putting off a radiant glow in the room. To see more pictures of the spaces view the Gallery. This is our party space! If you are looking for a space with endless character and fun, this is the one for you. This space is not meant for full dinner service, as there are no dining tables. 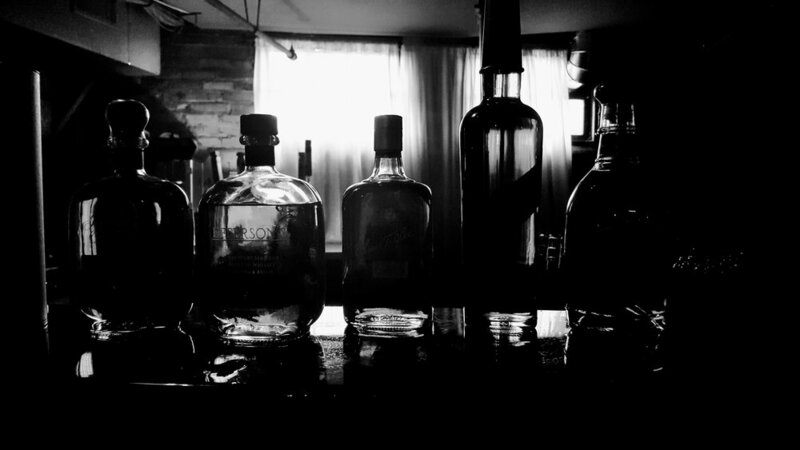 However, the Porter Room excels in hosting cocktail parties. The Porter Room is perfect for your next informal event. Offering a full service bar and plenty of mingling space, your guests can enjoy heavy hors d'oeuvres and cocktails while lounging on classic leather seating and enjoying the pub-style atmosphere. It is perfect for up to 100 people. We have a fully restored 1940's Snooker Table. It comes set, and ready to play. In addition, the room has three dartboard lanes. There is also a 4-person poker table and chairs. We provide all recreation equipment EXCEPT poker pieces. We do ask you bring your own playing cards, etc. The Porter Room is lit with waves of string lights. This makes the space significantly brighter than the Tavern. It's roomy layout keeps your guests comfortable as they mingle around the space with their food and drinks. Needing little party decoration, the Porter Room has all the character you need to blow your group away. Railyard was founded in September 2012. Through many changes to Montgomery's only brew pub throughout the years, Jamie Ray's Alabama craft beer remained the same. The restaurant area of the Railyard was closed to make way for Dreamland. On May 30, 2017 Dreamland had their last operating day at the location in the Alley and on June 2, 2017 Dreamland BBQ had their grand opening in the old Railyard location. 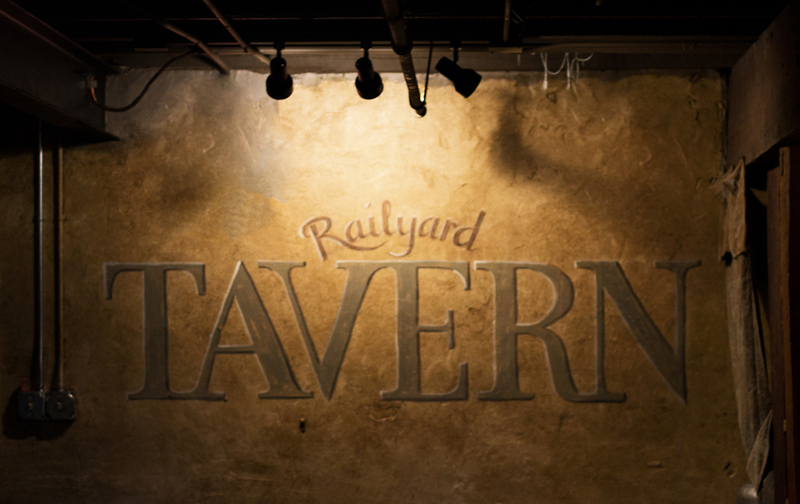 Railyard's food menu was discontinued, but the beer kept on brewing. Though 60 years of Dreamland traditions now surround the Railyard brew house, the same cold beer is still being poured by the pint. If you have questions concerning the brewery, the brews, or the Brew Master, please click the 'Contact' tab at the top of the page. Thank you! We will keep you informed of news, beers and happenings around the Railyard! Questions, comments, and concerns only. Please click on 'Request Date' to book an event. Thank you.